Lately, we have been hearing about Samsung’s new o-series of smartphones that are gearing up for a launch. 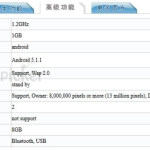 This week, Samsung’s Galaxy Mega On took the next step and received its certification from TENAA. 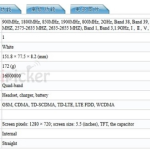 A few weeks back, the Galaxy Mega On passed through a benchmark test on GeekBench. We’re looking at a large handset with very low-end specifications, likely to be aimed at a more affordable crowd. The newly leaked TENAA certification gives us a sneak peek at what to expect time come launch. The The SM-G6000 (Galaxy Mega On) will have a 5.5-inch 720p display, a quad-core 1.2 GHz CPU back with 1GB of RAM, a 13MP rear-facing camera, a 5MP front-facing camera, 8GB of internal storage space expandable up to an additional 128GB via a built-in micro-SD card slot and weigh in at 172g. Support for 4G LTE connectivity is on-onboard and so is Android 5.1.1. No images have been spotted revealing anything when it comes to design for the upcoming smartphone, but we are bound to get something in the coming weeks. We’ll keep you posted.